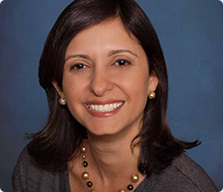 Maria Patricia Rivas Bondavalli is a gentle and innovative dermatologist treating her patients in Miami, FL. Dr. Bondavalli is bilingual, speaking fluently to her patients in both English and Spanish. She is certified by the American Board of Dermatology and specializes in both general dermatology and cosmetic dermatology. A pillar of our practice, Dr. Bondavalli received her education from the Universidad Central de Venezuela Escuela de Medicinia MJ Vargas. She then completed her internal medicine residency at the Orlando Regional Medical Center before attending the University of Miami to complete her dermatology residency at the Jackson Memorial Hospital. She was also a research fellow under Dr. Keyvan Nouri at the University of Miami and is affiliated with the Memorial Regional Hospital and the Memorial Regional South facility. She welcomes patients who suffer with acne, psoriasis, rosacea, skin cancer, spider veins, eczema, or patients that want to cheat the signs of aging in a natural and conservative way by using the latest technology. Irene Cuesta, PA-C is a board-certified Physician Assistant. She graduated from Nova Southeastern University in 1998 with an additional Master’s of Public Health. She has practiced medicine for over 12 years, with a particular fascination with skin and beauty. Her natural aptitude for clinical dermatology and aesthetic medicine has led to a loyal following among her patients. Irene and Dr. Barba have a unique team-based style to their work, and practice using the same philosophy and approach to skin care and cosmetic treatments. Irene has extensive training and is certified in acne treatments, medical-grade skin care, laser hair removal, IPL Photofacials, Botox®, fillers, fractional resurfacing treatments and laser procedures. Her expertise in Ulthera skin tightening treatments has earned her a following amongst men and women looking to tighten facial skin without surgery. Stella Barba is Director of Aesthetic Services & Hair Removal Specialist at the Barba Skin Clinic. A respected and highly sought-after facialist and hair-removal specialist, she has expertise in procedures including chemical peels, microdermabrasion, clinical facials, acne treatments, medical grade skincare and permanent hair removal, an art she performs on a daily basis using sophisticated laser treatments and/or electrolysis to give you the best possible results. She has performed over 15,000 facial and hair removal treatments at Barba Dermatogy and Barba Skin Clinic. Stella graduated from San Diego State University and is an active member of the Society for Clinical and Medical Hair Removal and Society of Dermatology Skincare Specialists. She has worked and trained closely with her sister, Dr. Alicia Barba, since moving to Miami in 2004, and together have created a successful business model that integrates clinical skincare treatments within a busy dermatology practice.